We’re all for saving money on cruises. And if you are a disabled passenger with a handicap, you should know that you could save a lot of money on parking. 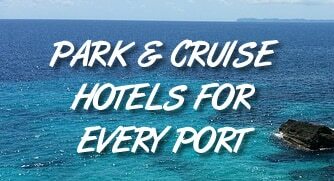 All of the cruise ports in Florida — Miami, Port Everglades, Port Canaveral, Tampa, and Jacksonville — have very convenient on-site cruise parking lots. This parking puts you just steps away from you ship, but it comes at a high price. These lots charge between $15-20 per day! A 7-day cruise can run a bill of $140 for parking alone. However, thanks to a Florida law parking for disabled guests can be free. That said, there have been some questions and mix-ups regarding the law. For that reason, we HIGHLY suggest you contact the port ahead of time to discuss your situation and confirm you can park for free. We’ve listed contact information below. One thing to note is that these rules require you to have modifications to your car, not just a disabled parking hangtag. To inquire if you will receive free parking, you can call the port at 305-347-5515. “At the entry to the parking garage or surface lot, pull a parking ticket from the automated machine and get the attention of one of the parking agents in an adjacent exit booth. Advise that parking agent that you would like a disability waiver of parking. The parking agent will call for a parking supervisor to determine if the vehicle qualifies. “Once the supervisor verifies that a waiver is allowable, the driver’s name, address and the registration number on the sticker, license plate or hanging tag will be recorded on the parking ticket and signed by the supervisor. The driver will be given the parking ticket and directed to enter the garage. Display a Disabled Veteran (DV) license plate issued under s. 320.084; s. 320.0842; or s. 320.0845, Florida Statutes. As with Port Canaveral and Port Everglades, handicapped guests must have some sort of modification to their vehicles. We called the port and confirmed that modifications are necessary. “Tampa Port Authority follows the Florida State Statute, 316.1964, relating to handicap parking as such all customers are required to pay for parking unless their vehicle has modified foot or hand controls, wheelchair lift or ramp or has been issued a “Toll Exempt” sticker from the state of Florida. Vehicles utilizing our valet parking service do not receive any discounts. Just as with most other ports, a hangtag on your mirror isn’t enough to earn an exemption at the Jacksonville cruise port. Here is what the cruise port’s website previously said, although it has since been removed. “In accordance with Florida Statute 316.1964, ONLY vehicles with specialized equipment such as ramps, lifts, foot or hand controls, for use by a person with a disability, or any vehicle that is displaying the “DV” license plate issued under s. 320.084 or the Florida Toll Exemption permit, is exempt from parking charges.” I have and used my DV plate at the Miami Cruise Port. I parked at no cost to me!!! The cruise ports in other Areas try to skirt the law by not posting the portion stating that a DV license Plate is also in that portion of the law not limiting it to special devices!! !